Lime Signs were approached to design and install some bespoke signage for a contemporary Champagne Bar in Central London. Only the highest quality signage would suffice given the high calibre clientel and we comissioned bespoke laser-cut brass signage with an accelerated aged effect, alongside an internal comission for the Perrier Jouet Champagne brand. 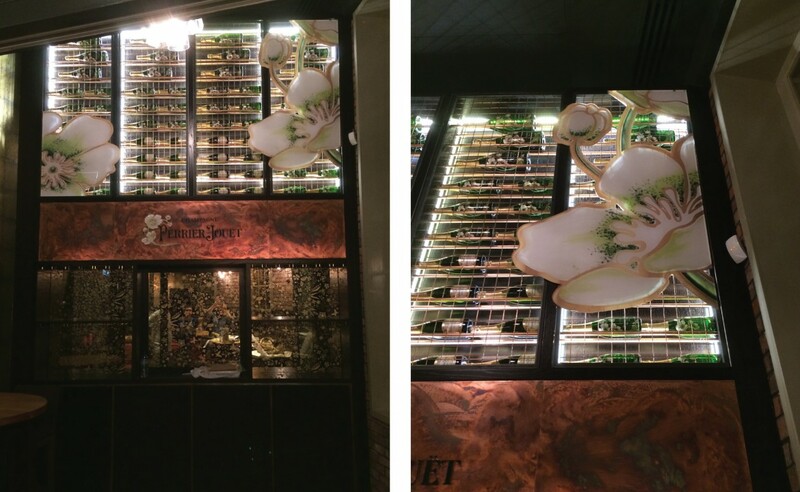 The brief was to brand an VIP area within the main bar to be exclusively for Perrier Jouet clients. Lime Signs completed the comission with a combination of metallic CAD cut vinyls, digitally printed PET window film (DecorGlaze) and laser-cut acrylic decorative signage. Laser-cut brass exterior lettering with an accelerated aged effect. Bespoke LED illuminated double sided projecting sign with aged brass framework. Internal CAD-cut metallic vinyl glass decoration. Digitally printed PET window film (DecorGlaze) for servicable white floral glass decoration. Laser cut acrylic internal signs with digitally printed vinyls and composite aluminium backboards with steel retainers.